Maximize your efficiency as a Windows 7 administrator, and master all the commands, keywords, command arguments, options, and prompts covered on Microsoft's MCTS 70-680, MCITP 70-685, and MCITP 70-686 exams! This easy, handy reference brings together all the techniques, tips, tools, and examples you'll need. It's your perfect take-anywhere guide to running Windows 7 environments-and passing Microsoft's three key Windows 7 administration exams. Covers all the commands you need to score higher on your MCTS 70-680 and MCITP 70-685/70-686 exams! 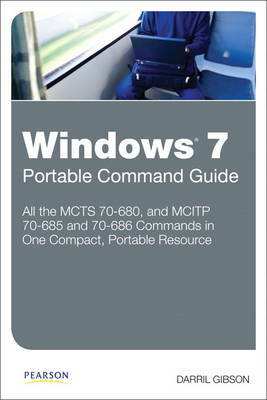 Your Perfect Take-Anywhere Windows 7 Command Resource!